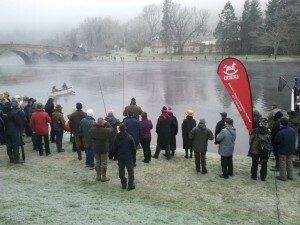 The Crowds gathered outside the Kenmore Hotel in eager anticipation of the first cast of the 2012 Salmon season. Newbeans Coffee, “the new coffee experience for coffee lovers and connoisseurs alike,” and the Kenmore Hotel, Scotland’s oldest inn, teamed up this past January to kick off the 2012 salmon season in the Scottish Highlands with eye-opening style. 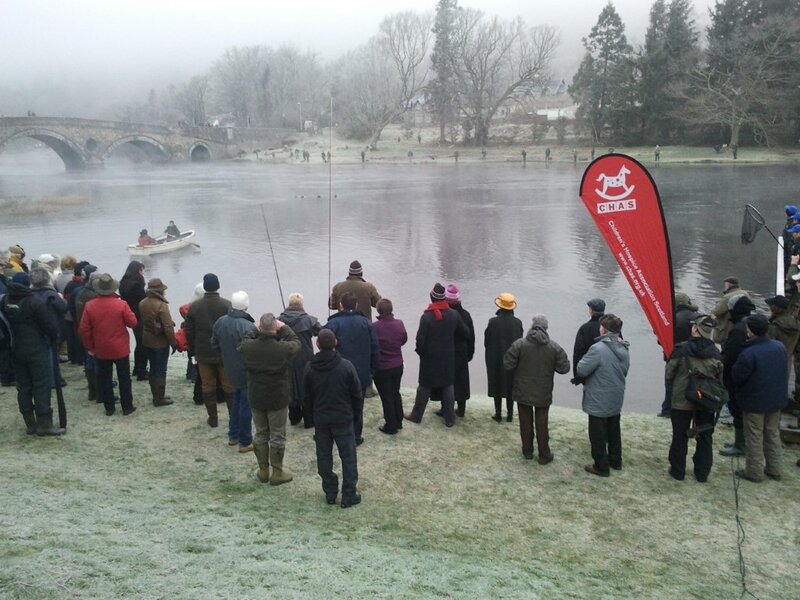 Every year in the middle of January, avid anglers from across Britain gather in the square of the village of Kenmore to witness the traditional Opening Day Ceremony of Scotland’s celebrated salmon season. 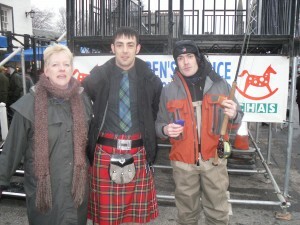 As all the fishermen and their supporters lined up to await the march to the River Tay behind the Vale of Atholl Junior Pipe Band, their mornings were brightened with many a warm cup of Newbeans Wake Up Blend. Newbeans Wake Up is a heavy and earthy brew of coffee, a perfect morning blend for the home, the office, or when marching in solemn procession behind a Pipe Band to go salmon fishing. To the skirl of the pipes and under perfect morning skies the procession made its way down to the banks of the mighty Tay, where a special platform stands in front of the venerable Kenmore Hotel. An invited dignitary was set to offer the ceremonial annual toast to bless the waters, but Ms. Norma Lindsay, the manager of the Kenmore, first made sure that plenty of bacon rolls and more hot cups of Newbeans Wake Up blend were passed out amongst the crowd. Only then, well fortified by bacon rolls and Newbeans coffee, did the fishermen take up their positions on both banks of the river as the final riverside ceremonies were wrapping up. Then, just as in every year for the past 65 years, the invited dignitary boarded a small boat and was rowed to the centre of the river to make the ceremonial first cast of the season. All the fishermen along the banks cried out “Tight Lines!” as they made their own first casts, and so the 2012 Salmon Season began. The very first salmon of the season was landed not three minutes after the first cast, a beautiful 18-pound spring run fish caught by Mr. Gerard McAuley from Glasgow. Not large enough to take the MacTaggart Kenmore Trophy and the gallon of Aberfeldy Dewar’s whisky awarded each year to the angler who lands the biggest fish on Opening Day, but an exciting time for Mr. McAuley just the same. All proceeds from salmon fishing permits for opening day at Kenmore, as well as from the charity auction dinner held that evening at the hotel, are donated to Angling for Youth Development (AFYD), the Children’s Hospice Association Scotland (CHAS) and The Nicola Murray Foundation. Newbeans, the UK’s most innovative coffee company, is proud to have been a part of this fantastic event. This is nice information I never know about this it must be a great fun and great gathering and the moments of enjoying. as for coffee lovers they really enjoy this type of activities.